Classic 243 – classic Microgaming slot with free spins! 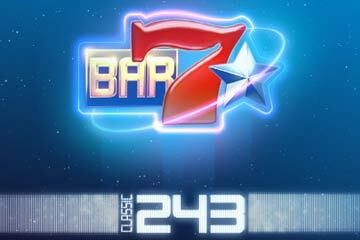 The Microgaming Casinos bring you Classic 243, a new neon-classic game with exceptional Free Spins features. This slot has a number of features such as 243 Ways To Win, Free Spins, Stacked Wilds in Free Spins and Gamble Game. Classic 243 can be accessed either on Desktop or your mobile device, meaning you don’t have to stop playing when you’re on a lucky streak. This slot has 5×3 reels, 10 winning symbols, Wild and Scatter symbols. Experience a world of bright colours and brighter winnings with atmospheric futuristic sounds and remarkable graphics. The action-loaded, retro and funky game will keep you glued to your screen with the heavily weighted Free Spins feature. Microgaming has introduced a feature called the Gamble Game feature. After every win you will be given an opportunity to hit the Gamble button on the bottom right of the main UI which will give you a chance to double up all your winnings up to maximum of 5x. All you have to do is hit the Gamble button and choose one of the glowing rectangles. If the rectangle starts spinning and sends of an energy pulse, that means that you have won and all of your winnings will be doubled. You will be given an additional chance with a maximum of picks to choose another rectangle. However, if you choose a rectangle that spins out in the background, all your winnings will be lost and you’ll be returned to the base game. This feature also works during the Free Spins feature where you will get the opportunity to double your winnings. When you land 3 or more Free Spins scatter symbols in any position during the base game, you will be awarded 10 Free Spins. (Note that the Free Spins symbols are the scatter symbols in Classic 243). If you land 3 or more Free Spins symbols within the Free Spins feature, you will be awarded with an additional 10 Free Spins. During this feature, 2 to 3 guaranteed stacked wilds are placed on every spin! Wild symbols will substitute any symbol on a win line except the Free Spins scatter symbol. If you land 5 Wild symbols, it will be equivalent to the highest win symbol. Play this 80’s themed slot for free at any of the Microgaming Casinos (eg. Royal Vegas, Euro Palace, Vegas Palms, 7Sultans, Platinum Play, Red Flush or Casino La Vida). Experience a world of colours that comes with stacks of winnings in every single spin. Are you ready to burst the bank?